Get paid on Equal Pay Day. Or at least let me ask your boss to close the wage gap by giving you a raise or equity (or a spot bonus until they can get their sh*t together and pay you equally). 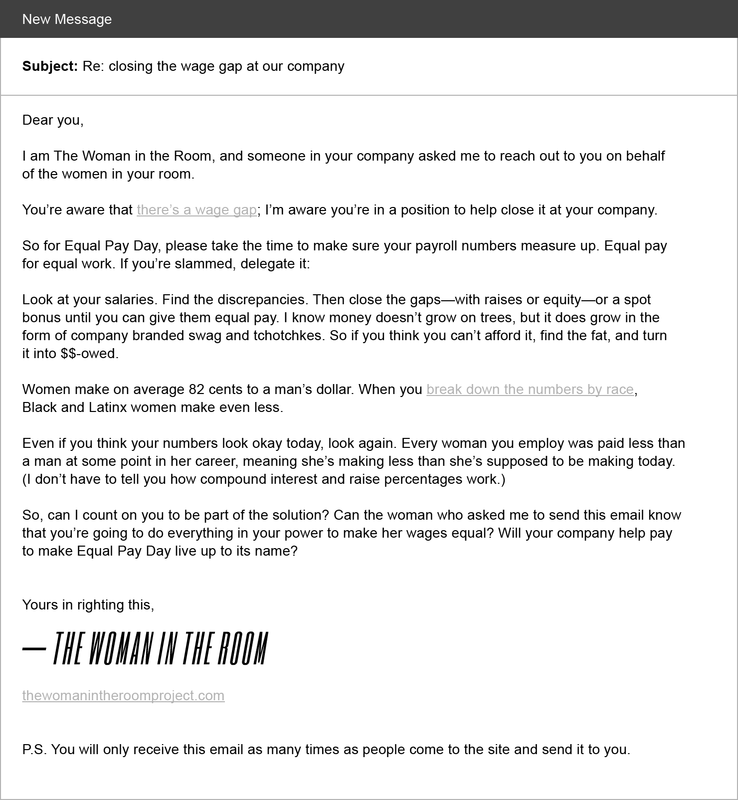 To send the following email to your boss from The Woman in the Room, scroll down. This email will be sent from thewomanintheroomproject@gmail.com to whichever address(es) you enter below. It will not, in any way, shape, or form be associated with you. Questions? Check out these FAQs. The Woman in the Room is an advocate for workplace equality, fairness, and justice. Her mission is to speak up for working women whenever and wherever they need it—be it in a conference room or a CMO’s inbox.